Phentermine for Weight Loss: What Is It and Who Needs It? Being overweight can be a frustrating situation, especially if your weight problems have led to health problems such as diabetes, high blood pressure, or heart disease. Those who are overweight can experience everything from social isolation to lack of energy to low self-esteem. Though some are able to lose the weight they want to through lifestyle changes including exercise and changes to their diets, others simply cannot achieve their weight loss goals without some help. If you have tried changing your lifestyle and diet and have also explored other weight loss options that have not proven effective, you may benefit from the short-term use of the drug Phentermine. If you believe Phentermine may be a good choice for your weight loss program, continue reading for important information. Our weight loss clinic in San Francisco is accepting patients on Saturdays and Sundays, feel free to call us 11 am to 7 pm. 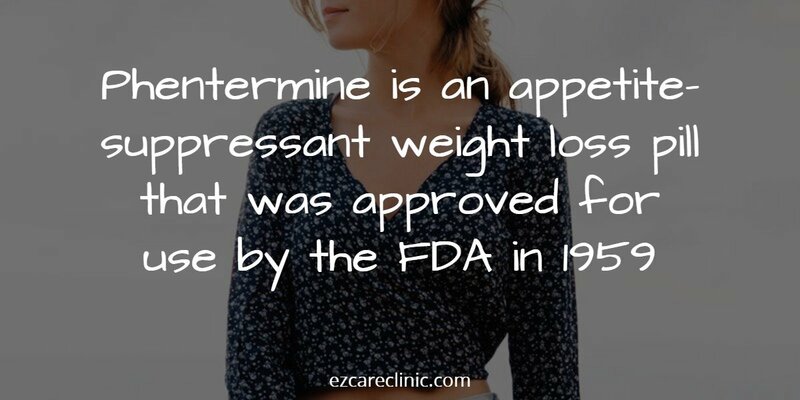 Phentermine is an appetite-suppressant weight loss pill that was approved for use by the FDA in 1959. Though similar drugs such as Fenfluramine and Dexfenfluramine have been taken off the market, Phentermine has remained a legal drug for physicians to prescribe to their patients. Similar to an amphetamine, Phentermine works on the central nervous system and stimulates the hypothalamus of the brain to produce neurotransmitters such as serotonin, adrenaline, and noradrenaline, which are all natural appetite suppressants and stimulants. In addition, the drug interrupts the hunger signals your body produces before they get to the brain. This helps patients feel less hungry and therefore be able to make smarter decisions about what and how much they eat. Who Can Benefit from Phentermine? Those who have tried other forms of weight loss treatment with no success could be good candidates for Phentermine. Especially good candidates are those who have obesity-related health problems such as high blood pressure, high cholesterol, or diabetes as the side effects of taking Phentermine are less serious than the complications of remaining overweight and unhealthy. There are some individuals who should not take Phentermine. These include pregnant women or those who are nursing a baby, those with an overactive thyroid, pulmonary hypertension, a history of heart disease, glaucoma, or a history of drug or alcohol abuse. When you meet with a qualified physician who can prescribe Phentermine, he or she will go through your health history to determine if you have any risk factors that would make the use of Phentermine dangerous or unhealthy. 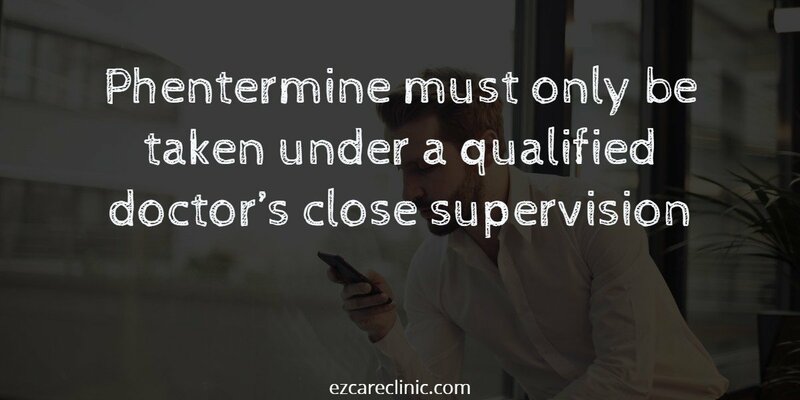 Phentermine must only be taken under a qualified doctor’s close supervision. Due to the addictive quality of the drug and the possible side effects, if it is taken improperly, you may only take Phentermine if it is prescribed by a doctor and if you meet with your doctor on a regular basis. Most physicians will suggest using Phentermine for a period of a few days to a few weeks. This is not a long-term solution to weight loss but is instead meant to kick-start a weight loss plan that leads to long-term lifestyle changes. After evaluating you and your health records, a qualified physician will determine the correct dosage of Phentermine and how long you should take the drug. The physician will also give you directions on discontinuing use of the drug as withdrawal symptoms can occur if you abruptly stop taking the drug. Phentermine should not be the sole means of weight loss. In addition to prescribing Phentermine, your physician will also make suggestions for lifestyle changes that will add to your healthy weight loss goals. These may include increased exercise, reduction in calories, and other adjustments that will aid you in your weight loss efforts. Because it has amphetamine-like properties, Phentermine can cause side effects in some individuals. These can include feelings of restlessness or hyperactivity, headaches or dizziness, dry mouth, insomnia, upset stomach, changes in libido, and diarrhea or constipation. While these are normal side effects, they can occasionally be severe enough to cause a patient to discontinue use of the drug. Serious side effects can also occur with Phentermine and should be reported to your physician immediately if you experience them. These include chest tightness, trouble breathing, swelling of the face or throat, pounding heartbeat, extreme changes in mood, dangerously high blood pressure, confusion, and unusual thoughts or behaviors. These could indicate a serious allergic reaction and you should call your doctor immediately should you experience any of these symptoms. Where Can I Get Phentermine in San Francisco? It is imperative that you work with a qualified physician who is familiar with treating patients with Phentermine. 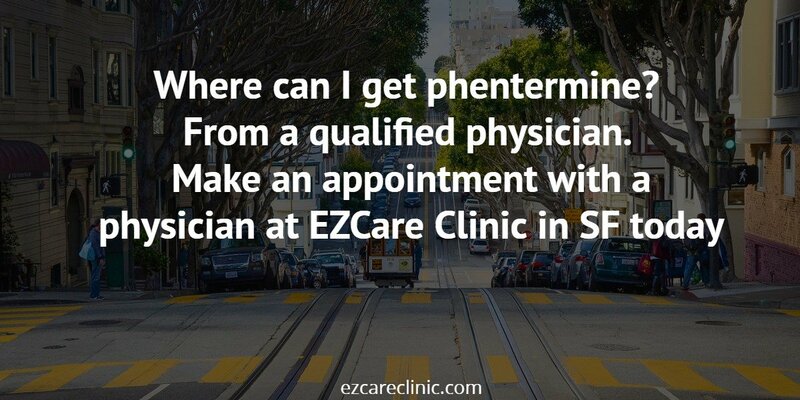 To find a qualified physician in the San Francisco area, search for a clinic that has a medical weight loss division that employs qualified physicians. You should also look for a clinic that offers both walk-in and appointments and that is open late to accommodate your schedule. If you would like to talk to a qualified weight loss physician at EZCare Clinic, walk-in or schedule an appointment today. We are open seven days a week from 11 am to 7 pm. Get Your Phentermine Prescription in San Francisco today! Losing weight is very difficult to me. I am 172 pounds and no matter how well i eat and how much i exercise i don’t seen to shed any pounds!! I have gone to several different doctors and they have all just told me to do what i am currently doing and that i would see results sometime in the near future..I came to EZ Care about 2 1/2 weeks with the hope to actually get some help and that is exactly what i got! Dr. Stacie Daniels was amazing and did her best to help me feel better about myself as well as give me tips to keep off what i lose. She prescribed me Phentermine and designed a dieting and weight loss routine for me and so far I am so happy I have lost 7 pounds in 2 1/2 weeks! that is amazing for me since i initially couldn’t lose any weight. I am without a doubt coming back to this clinic.\ as it exceeded my expectations. I want to give a shout out to ezcare for prescribing me a product that changed my life. I’ve been a loyal patient for 4 months now. Let me tell you why I recommend it… I was really blubbery. I am in my 30’s and the last ten years of my life have been an endless loop of working, caring for my 2 kids, and enjoying life (which means going out to eat and drink a lot). Stress is part of my life and I’m sure you can understand if you have kids like I do. I just don’t have time or discipline to hit the gym at 4am before the kids get up and work starts. This is why Phentermine is so awesome: I didn’t have to do anything at all other than remember to take it. It really does all the work and I don’t have to adjust my lifestyle at all. I started taking these pills about a week ago. I started off taking one every morning as soon as I woke up, before coffee. I took my first pill the minute they arrived, which was mid afternoon, and I felt tingly for a few seconds and then it went away. I was off of work that day so I decided to be lazy but 30 minutes after I took it I was up cleaning the house, which was not my intention for the day. I then started taking them immediately every morning. The picture I have posted is 5 days in! I was down 2lbs already. Today, day 7, I am down 3. My stomach was always so tight because I would eat until it hurt. So much bloating is gone too! 3 pounds doesnt seem like much but it is so awesome to see the scale go down. I only changed a few things in my diet, I drink more water now, about 5-6 bottles a day when before I would probably have 3 in a week, I still drink soda I just have one or two a week, I just don’t ever crave it. I started eating eggs for breakfast but other than I didn’t change anything. I do not feel the need to snack constantly anymore and I feel full much faster when eating lunch or dinner. Today, since I have been been taking this for a week, I started taking two a day and will continue to do so, however, I space it atleast 4 hours apart. I felt totally normal and maintained the energy. Some days my eyes feel tired but my hands and body just want to clean, clean, clean, (I am a housekeeper). I never had any light headed, jittery feelings, or anything of the sort except the few seconds of tingling at first. I can not wait to update. My review once I have finished! Let me know if this has been helpful! I’m 31 years old and have really noticed the changes in my body. I am set to go on a 2 week vacation to the Philippines and was a little fed up with what I was looking at in the mirror. I had packed on some winter weight, and I wanted to get back on track with my fitness. The cold along with the extra weight made me feel slow, unmotivated and with no energy. I’ve tried fat burners and weight loss products before, so I was just really going through amazon looking for something that had good reviews. I decided to try Phentermine, and figured I’d try this along with my new routine. I started using this product 3 weeks ago. I matched it with hot yoga twice a week, I worked out everyday at the gym for an hour (which included a minimum 3 mile run), cut my calorie intake by 300 and stretched before bed time. I do eat, but reduced portions and cut out fast food. This medication has helped me curb my appetite! Working in an office, it’s hard to stay away from my snack drawer. I also noticed that my energy levels were up there and I was able to crush my 3 mile runs with ease (now running 5 miles every other day). Before I would have to stop and walk a little, but taking skinny gal helped me go nonstop! I would recommend this product. I asked for the free bottle because I really feel this product is going to help me achieve my goals! I have tried many different pills for weight loss, energy, appetite suppressant, and fat burners. This worked on the 1st pill. I was very worried about feeling jittery and having anxiety with the pill, as I drink a lot of coffee, it never happened. I immediately felt (within 45min) a boost of good energy, steady energy and my appetite was NON EXISTANT! I have had no headaches, jitters, excess thirst or troubles sleeping. I talk to many people throughout the day and drive a lot, these pills have given me a definite focus too. I really wish I would have known about this clinic and these pills years ago! I highly recommend phentermine.